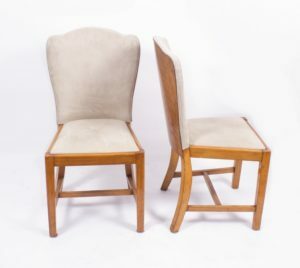 We are sure that Art Deco aficionados are going to love these antique Art Deco dining chairs which date from around 1930 and are offered as a set of six Art Deco Chairs for sale in truly excellent condition. These lovely Art Deco chairs have been French polished in our own workshops and to a very high standard of workmanship so as to highlight and feature the typically beautiful figured grain of the burr walnut that has been used in their construction. 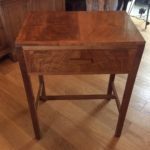 It is easy to understand just why it is that this particular type of wood is so much appreciated by craftsmen such as furniture makers and furniture lovers. 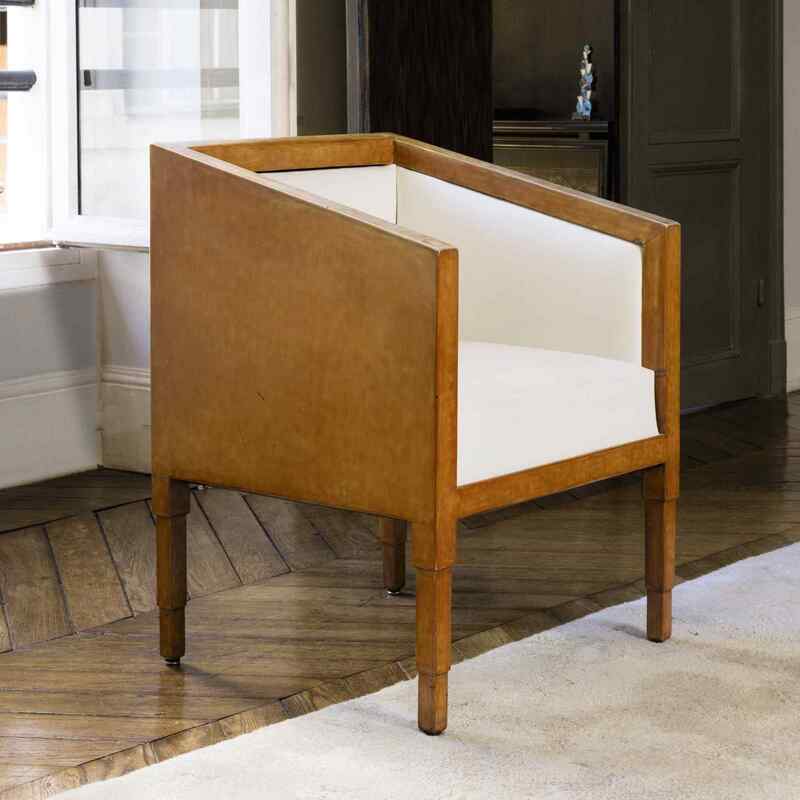 The chairs have been upholstered in a hard wearing but attractive cream coloured suede material. 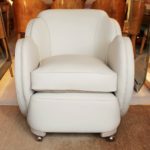 Those who appreciate the Art Deco furniture style will find much to appreciate here with this set of chairs because they are truly representative of the style of one of Art Deco’s most famous makers, Epstein. 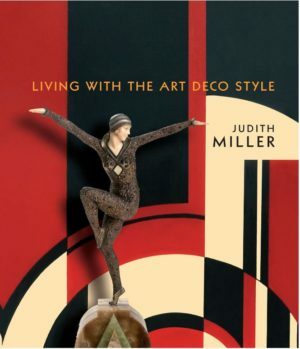 This celebrated London based furniture maker was responsible for producing large quantities of typical Art Deco pieces during the early part of the 20th century and their work is particularly sought after to this day. 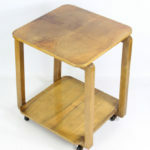 These Epstein style Art Deco chairs are offered for sale in excellent condition. 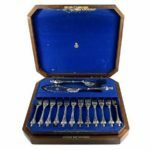 They have been beautifully restored in our own workshops, by our own craftsmen, we urge you to see the photographs we have supplied for confirmation of this. 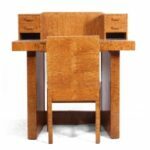 These Art Deco dining chairs measure 95 cm in height x 58 cm wide x 60 cm deep (Height 3 feet, 1 inch x Width 1 foot, 11 inches x Depth 2 feet). 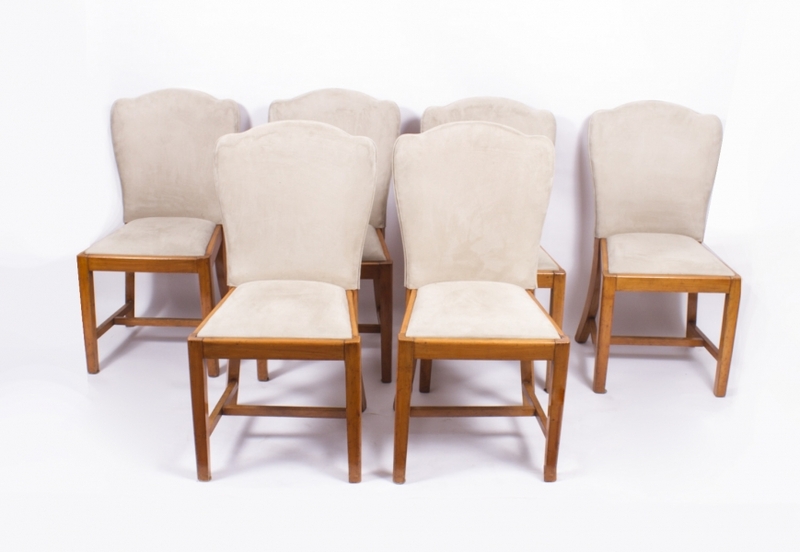 This set of six antique Art Deco dining chairs, along with many other items of antique and contemporary Art Deco furniture, can be seen in our London showroom which is open every weekday from 10am until 5pm and also on occasional Saturdays – see opening hours above and on the home page. 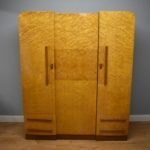 If you are unable to make the trip to London please contact us using the details above and ask our in-house furniture experts any questions that you may have, quoting item reference: 07196 when doing so. 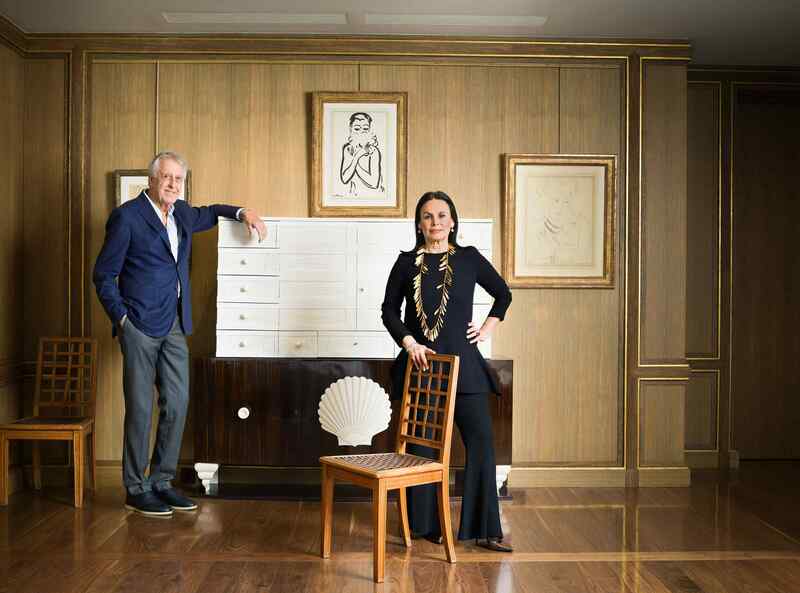 If you do visit the showroom you will also be able to view many other items of Art Deco furniture, and many other periods and styles, including antique dining tables and bespoke contemporary tables, chairs and desks. 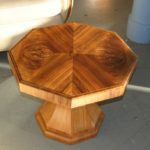 We ship items of contemporary and antique furniture to any mainland UK address, free of charge. 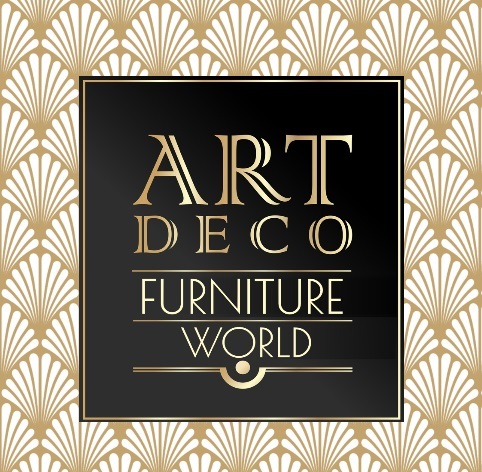 If you would like to have this set of Art Deco dining chairs shipped to a non-UK destination, we will carefully pack and ship them worldwide but please request a shipping quote before making a purchase so that we can be sure to provide you with the service you require. If you are not satisfied with your purchase of these Epstein dining chairs, in keeping with the Distance Selling Regulations, we offer a 14-day money back guarantee. 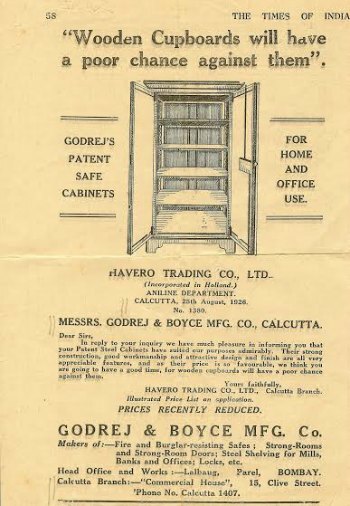 You must return this set of Art Deco chairs in their original packaging and condition to be eligible for a refund. Please be aware that you are responsible for paying the return shipping charges, unless we sent you the wrong item(s), i.e. one that is materially different to what you ordered.